This section features materials and training opportunities geared for teachers interested in teaching about the Lyme Art Colony. The Teacher Resources section outlines the notebook version of much of the information available on-line that is available to teachers at all levels. The In-Service Training section outlines the possibilities for using the Florence Griswold Museum as a destination for a teachers’ in-service day for your school or district. 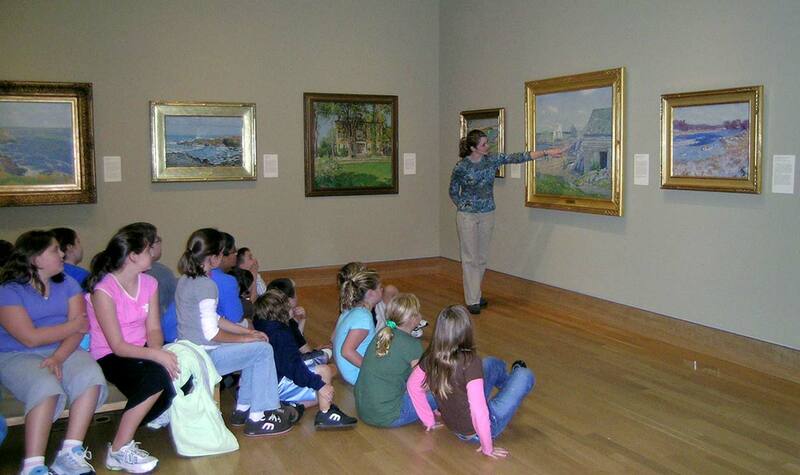 The Florence Griswold Museum is an ideal place for teacher in-service days and teacher institutes. To learn more about the following programs, or to design your own to fit your particular learning objectives and goals, contact the Director of Education, David D.J. Rau, at (860) 434-5542, ext. 115. Call the Education Department to discuss your individual interest and learning goals and we can tailor an in-service day for you. Working with the staff of the Museum, teachers get a rare behind-the-scenes tour of the Museum learning the inner workings of the institution. From store rooms to exhibition galleries, the day will help to de-mystify the museum and give teachers a better appreciation of its role as an educational resource. 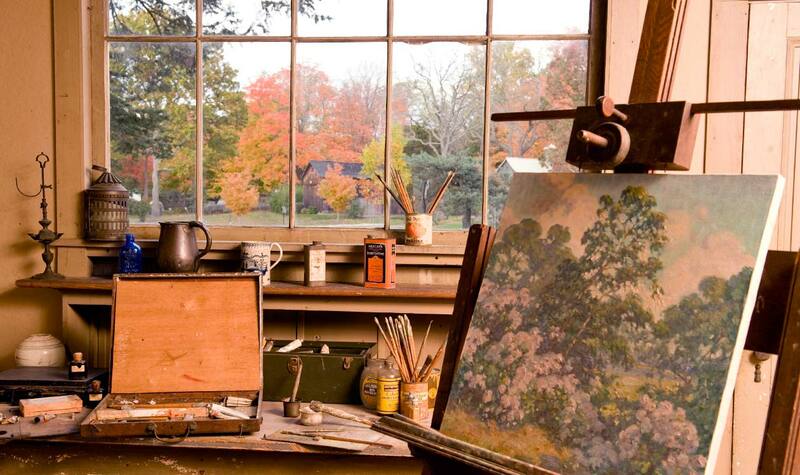 Step into the role of an Old Lyme artist. Teachers can enjoy an intensive tour of the Griswold House, the boardinghouse of the Lyme Art Colony with a member of the Museum’s Education Department learning the history of the site before heading out for a picnic and afternoon of painting en plein air along the riverbank. Come to the Museum for an intense workshop on navigating the Museum’s on-line learning modules. Both The Fox Chase and In Situ: The Painted Panels were inspired by real objects in the Museum’s collection. Come study the authentic artifacts before delving into the teaching potential of the on-line learning resources. Come and learn the basics of Visual Thinking Strategies in the Museum galleries. Teachers can learn the applications for using this method in the classroom as a way to enhance students visual literacy. Aligning the Museum’s Core Interpretive Themes with the Connecticut State Department of Education ’s Curricular Goals and Standards for Students K-12. The Museum adopted five interpretive themes that are consistent with the information provided both on site at the Museum as well as on-line on the Museum’s website. This set of pages identifies and defines the five themes and sites connections between the theme content and key content areas for teaching students in Connecticut and beyond. The curricular goals and standards are from The Connecticut Framework: K-12 Curricular Goals & Standards (adopted in March 1998, published by the Connecticut State Department of Education, Division of Teaching and Learning). Answer the following sets of questions while looking at your work of art. What is going on in the painting? What is the title of the painting? How do you know the title of the painting? What title would you give the painting? What would you change about the painting? Why would you make that change? Where do you think the scene in the painting takes place? What else can you say about where the painting takes place? When do you think the artist painted the painting? What else can you say about when the painting was made? Why do you think the artist painted the painting? What else can you say about why you think the artist painted the painting? Who was the artist who painted the painting? How do you know the name of the painter? What else do you know about this artist? Where could you look to learn more about this artist? What in the painting is worthy of a Wow!? What do you think is the most special part of the painting? Developed by Philip Yenawine (Former Director of Education at the Museum of Modern Art in New York) and Abigail Housen (a developmental psychologist and researcher in aesthetics), contact Visual Understanding in Education. The movie opens with the Lyme artist George Bruestle painting in his studio. It continues with Mr. and Mrs. Bruestle and their dogs enjoying the beautiful setting of his house overlooking the Eight Mile River in Lyme. Note the 360-degree panorama of the river and hills around their home revealing the more open landscape of the 1930s. The next sequence shows the figurative artist Ivan Olinsky painting his daughter Tosca (also an artist) in his studio in Lyme. The Olinskys come outside the studio to greet the artist Edward Volkert and the film shows the Olinsky house on Grassy Hill Road. Percival Rosseau, known nationally for his paintings of hunting dogs, plays with his many beloved hounds at his home on Grassy Hill Road. He often painted pointers and setters in profile, positioning them on the wooden platform upon which he sits in the opening scene. Florence Griswold makes her first appearance accompanied by a woman, currently unidentified, at the entrance to the Lyme Art Gallery. Miss Florence served as its manager during its early years. George Bruestle is painting once again, this time outdoors. Judging from the foliage, the season is summer. Edward Volkert is shown painting in his studio. Note the unusual panels inset into his studio windows. The artist reportedly changed these with each season! An unidentified farmer (with white shirt and tie) hitches a yoke to a team of oxen and then displays his mastery of moving these draft animals around. Volkert sets up his easel and paints the oxen in the farmer’s field. Volkert and the farmer (now shown wearing overalls) pose astride their mutually regarded subject. Scenes of Volkert’s house and studio on Sterling City Road in Lyme overlooking a broad valley. Volkert hams for the camera in a way that suggests perhaps he knows the camera operator personally. Opera singer Anita Higgins poses as a nymph bathing in the Beaver Brook in Lyme. Her husband, the artist Eugene Higgins, is shown in his studio. Anita and Eugene frolic around their property, enthusiastically enjoying Lyme’s country life with their farm animals and pets. The Higgins’ were ardent nudists. Guests to their property announced their arrival by ringing a bell at the entrance by the road. Edward Volkert and publicist Charles Norwood (?) walk out of the Lyme Art Gallery followed by Florence Griswold and another unidentified woman. Patrons visit the gallery. Miss Florence walks toward camera, wearing her characteristic flowing scarf and high collar dress of the late Victorian period. The camera pans across the Florence Griswold House and then shows Florence Griswold by the back door as she contentedly strokes her cats. She then strolls in her garden picking flowers and gesturing toward unseen cats. With all the attention lavished on the farm animals, dogs, and cats of the Colony, the film ends, appropriately, by focusing on two geese in a barnyard being admired by Miss Florence. These lesson plans were designed as in-class group learning experiences with distinct on-line research components to be completed independently by students when they have access to a computer (in class, at home, etc. ), and culminate in a final product or group presentation. They were designed to use the resources (both in words and pictures) available from the Museum’s teacher resources in meaningful, engaging, and innovative ways. The content of the on-line sites dovetails with the five Interpretive Themes used in the Griswold Boardinghouse for Artists on site at the Florence Griswold Museum in Old Lyme. The lessons align with relevant goals selected from The Connecticut Framework: K-12 Curricular Goals and Standards (adopted in March 1998, published by the Connecticut State Department of Education, Division of Teaching and Learning). Although the lesson plans have been developed with certain grade levels in mind, Elementary (K-4), Middle School (5-8), and High School (9-12), and are aligned with curricular goals for that level, many of the activities could also work with students at other grade levels with slight modifications. Please share your suggestions for making the lessons better. Let the Museum know how these lessons worked for you and your students by sending your comments and suggestions to david@flogris.org. Educators are encouraged to submit copies of final products and/or digital images to be shared on our website. The lessons were based on the TRIBES® Learning Experiences Model. For more information about TRIBES®, please visit their website.